Marposs gauging fingers are used for measuring in process gauging of internal and external diameters during precise grinding operation of mass-produced components such as Crankshaft, Camshafts, Gear Shaft etc. in auto industries and in bearing industries. 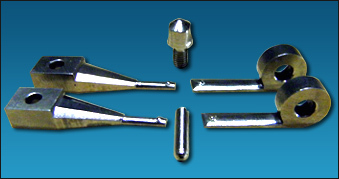 We manufacturers these fingers with duly lapped diamond cone, blended at tip with radius, enhancing consistency, repeatability, durability and interchangeability.